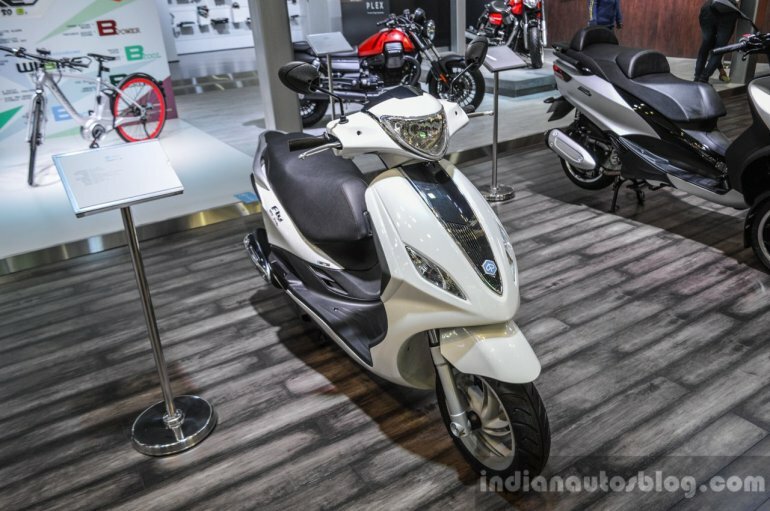 Not for sale in India. 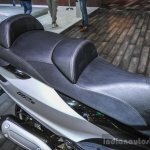 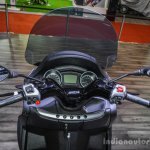 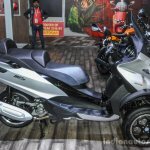 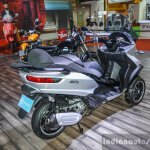 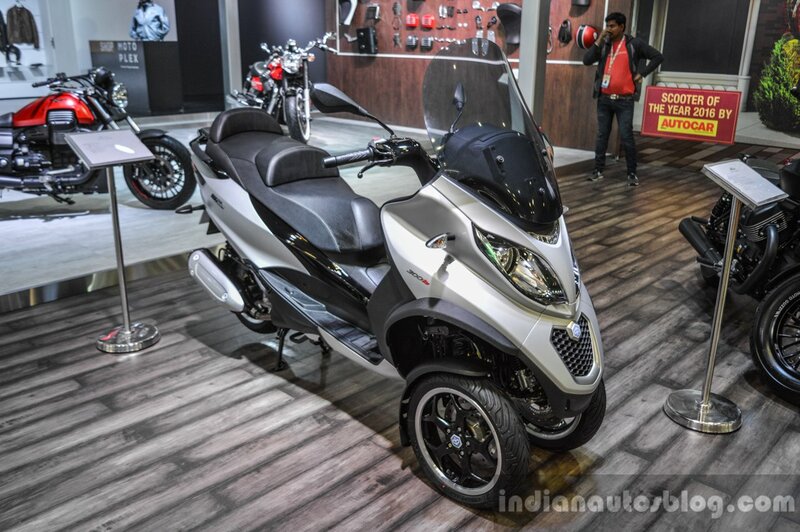 Piaggio showcased the Piaggio MP3 300 Lt Sport ABS and the Piaggio Fly 125 at the Auto Expo 2016 in Greater Noida. 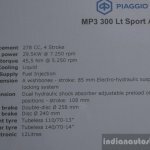 They are not on sale in India. 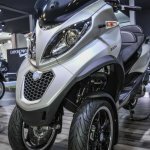 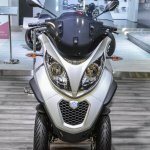 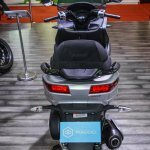 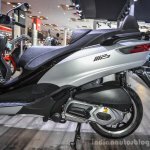 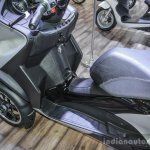 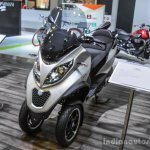 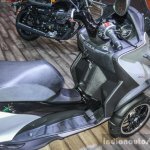 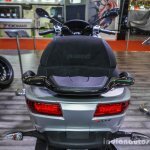 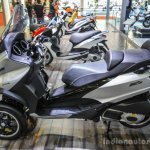 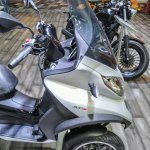 The Piaggio MP3 300 is a tilting three-wheeled scooter that is powered by a 278 cc liquid-cooled single-cylinder fuel-injected engine that produces 40.1 PS at 7,250 rpm and 45.5 Nm at 5,250 rpm. 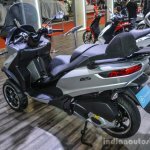 It is equipped with a wishbone type front suspension with 85 mm electro-hydraulic suspension locking system, and a rear suspension with dual hydraulic shock absorber with 108 mm stroke and with four adjustable preload positions, a 258 mm double disc brake upfront, a 240 mm single disc brake at the rear, 110/70-13 tubeless front tyre, 140/70-14 tubeless tyre at the rear, and a 12-litre fuel tank. 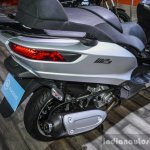 The Piaggio Fly 125 is powered by a 124 cc liquid-cooled single-cylinder fuel-injected engine that produces 12.1 PS at 8,250 rpm and 10.7 Nm at 6,750 rpm. 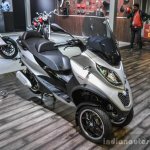 It features a 32 mm hydraulic telescopic fork, rear suspension with hydraulic shock absorber, 220 mm front disc brake with twin-piston caliper, 220 mm rear disc brake, 120/70-12 tubeless tyres and a seven-litre fuel tank.